Hacked Gadgets :: View topic - need help with this simple scenario..
need help with this simple scenario..
Posted: Mon Jan 12, 2009 2:48 pm Post subject: need help with this simple scenario.. I have two LEDS, green and red. 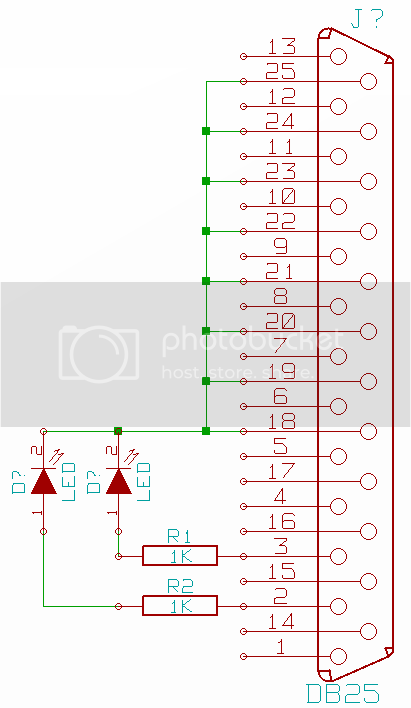 I wanna control those LEDS using PC connected with serial port (com) and microcontroller. with this simple scenario, I hope I can build more complex scenario in controllong device from PC.. I need list of components( type of microcontroller, resistor, capacitor ) needed to build this.. If you have to use the serial port and micro-controller then I'd use a PICAXE. You don't need to by a programing board you just need a few parts. how easy is that(using pararel port)? does it takes low cost too? Heres some more info. on the parallel port.